Blank custom thundersticks are the original noisemaker. Liven up your next event with a white noisemaker customized with your logo. These durable, inflatable thunderstix are a perfect way to promote or support your favorite organization. 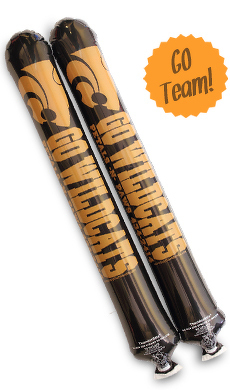 The printed colored thunderstix noisemakers are the perfect mix of affordability and quality to assure that you have the loudest noisemaker for any sporting event. Often used for promotional purposes at any company or organization occasion or noise makers for football games. Distribute among masses to receive instant brand recognition. Imprint your favorite basketball team’s logo and name to show off your pride. Great for that passionate hockey fan looking to score some serious noise.